It’s no secret that LRT is City Council’s top infrastructure priority. They have repeatedly stressed the importance of expanding our LRT network, and scored a win recently with the Valley Line. LRT is part of a bigger transformation that Council hopes to realize, which is a shift away from the car-dominated transportation network we have today to a network that offers realistic choice through a range of travel options. At Wednesday’s City Council meeting, they approved a new goal for The Way We Move that makes this transformation clearer. 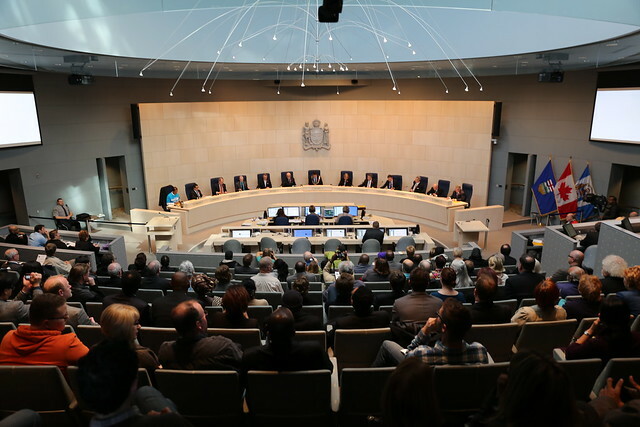 In November last year, Edmonton’s new City Council took part in a series of strategic planning sessions. In addition to serving as a crash course on the City’s strategy and approach to long-term planning, the sessions were also a way to ensure the new Councillors were on board with the corporate outcomes, measures, and targets for each of the six 10-year goals identified in The Way Ahead. Among the key outcomes of those meetings were a desire by Council to review the goal statement for The Way We Move, as well as a desire to emphasize public engagement within The Ways. The public engagement action is being handled through a new Council Initiative, and I think we’ll hear much more about that in the weeks ahead. I’m looking forward to it. The goal for The Way We Move was reviewed and discussed at a couple of subsequent Council meetings, notably January 28 and March 11. Council wanted to stress the use of public transit, but they wanted to make it clear that Edmontonians would have choice. The goal they ultimately settled on reflects both of those desires and has led to a new set of outcomes too. The current goal statement for The Way We Move is focused on “mode shift”, which is meant to convey that while the majority of Edmontonians get around the city using vehicles today, that should not always be the case. The reasons for needing a shift included changing our urban form to be more sustainable, accessibility, supporting active and healthy lifestyles, reducing the impact on the environment, and attracting business and talent to Edmonton. While the current wording attempts to connect with the other goals in The Way Ahead, it doesn’t as forcefully make the case for offering alternatives to single-occupant vehicles. The other challenge is that “mode shift” doesn’t mean anything to most of us, and sounds bureaucratic. Perhaps more importantly, this was the only goal that was presented as if was worth doing solely to achieve the other goals. Surely a shift in how we move around the city should have benefits of its own! The connection to the other goals is still present in the new wording, but not at the expense of highlighting the desire for alternatives to the car. There’s also the suggestion that trade-offs will need to be made in order to create a system that offers choice – we can’t have it all without making some hard decisions. The new goal is much more approachable now that “mode shift” is gone. Gone are words like “minimized”, “supports”, or “strives”. The new language seems less open to interpretation, which is a good thing for determining progress. The next step is for Administration to prepare measures and targets based on these outcomes and to update The Way Ahead (there are currently 65 approved measures and 27 approved targets). It’s great that Council wanted to strengthen the transportation goal and that they have simplified the outcomes. Most of this strategic planning was completed by previous Councils, so the exercise probably helped to ensure our current Councillors feel a sense of ownership. But the challenge remains: we need to implement the plans and see results. An annual report on progress will go to Council next year, based on the new outcomes, measures, and targets.